For starters, what bands were you guys a part of prior to Acting Natural? How long has the band been around? Hello! This is Eric responding, Acting Natural was actually my first band... I was in the 8th grade when we got together, about 8 years ago. Same for JD, he joined only a few months later. Jesse was in another group at first so we had another fellow on drums for about the first 8 months. We all went to the same school so we already knew of Jesse and originally wanted him to join but he was already in a band. So we got someone else until we built up enough courage to send him a message and ask him to leave his group and join us. Our name was somewhat spawned from an old song by Buck Owens called 'Act Naturally'. We were originally called 'The Frames', but some group out of Ireland started doing pretty well and reached out to us about having the same name. So we decided ditch it and find something better. 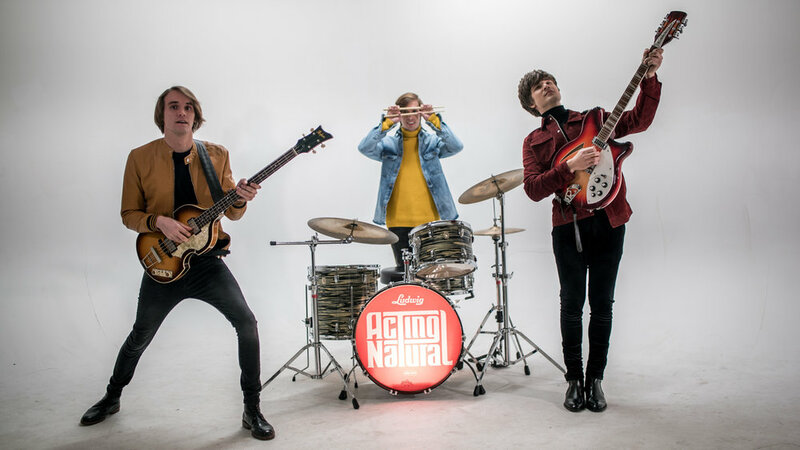 We were on the way to a gig and I was listening to some music when 'Act Naturally' came on... Something about the title stuck a chord and had us playing around with the two words. Eventually, coming up with Acting Natural. I would say it means to just be who you are... Whether your a fireman, teacher or an artist. Be you. We all write in the band so sometimes we will sit down all together and work on a song or one of us will bring an idea to the table and we will take it from there. Always varies really... I don't think there is one set way to write. Different songs come to you in all sorts of ways. As for themes, I'd say we sing a lot about love, life, personal experiences or others experiences with both. I think our music has an overall positive, relatable vibe to it. Now and over time we will for sure experiment with many different concepts but no matter what you will always have songs that are in that realm. Love is just one of the most important and meaningful things in the world to us humans. There are so many amazing artist around that we are inspired by. Of course we always have a strong inspiration of the music we grew up listening to...legendary rock bands of the 60s and 70s to Stevie wonder and motown. But we definitely have been digging a lot of current artist that is mixing into our influence to make a pretty cool sound in some of our new material. Tame Impala, Arctic Monkeys, The Weekend, Coldplay, Ed Sheeran... All great current artist that we have been digging. For me The Beatles got me really hooked on music and being in a band...Especially as a songwriter, their music is just written so well in every aspect of a song. We all have our own little pre show routine I think. I usually like to take a shower, clear my head of everything else going but the show ahead. Then get dressed, start warming up my voice with the guys and loosening up on my acoustic. Biggest moment so far, id say was being invited onto iHeartradios Jingle Ball tour. Especially the New York City show at Hammerstein Ballroom... We were on the tour with so many unbelievably talented musicians and got to perform in front of the best crowds we've ever played! There so many answers to this question! For me, a few would be Red hot chili peppers, Oasis, Coldplay, The Beatles, Rolling Stones... All those groups have had some of the most phenomenal tours in the history of rock music. Playing to the biggest crowds all over the world and getting to connect to some many people night after night. Also I can't imagine how fun it would be to hang with any of those guys on the road and in-between shows...getting to jam, maybe little bit of partying here and there. I'd just like to say thank you for taking interest in our music! We love having the chance to spread the word and reach new amazing fans every chance we get. We hope you readers out there check out some of our tunes and join us on our journey! Newer:Sophomore Slump Fest 2018 Official LineupOlder:Five Finger Death Punch Premiere New Song "Sham Pain"